Read more about 30DTAM or purchase by clicking here. Inside us all is a sincere longing to live a wealthy, loving, joyful, and profoundly fulfilled life – a life that has been graced with miracles. It is clear that these deep longings are in the hearts of our society as we browse through the plethora of self-help and personal development books filled with practices promising the miracle of making one’s dreams come true. Unfortunately, most of these “solutions” to “getting everything you want” are rooted in the personal will, psychological ego, or fantasyland of magical-thinking. If manifesting miracles were really as simple as “thinking miraculous thoughts” or gluing a photo of Prince Charming to a vision board, why aren’t the hearts (and bank accounts) of every human abundantly full? More importantly, why isn’t there Peace on Earth? 30 Days to a Miracle (30DTAM) is an experiment utilizing the powerful practice of prayer to assist you in surrendering your personal will so you can begin to form a direct and personal relationship with the only power that directs miracles– Divine power. Instead of a religious practice, 30DTAM is a spiritual experiment. Prayer itself is Universal; it is the common denominator of all religions. Drawing inspiration from Gnosis, Vedanta, Tantra, Yoga, Energy Psychology, Star Wars, and sports (yep, even football can inspire awakening the consciousness), 30DTAM is a journey truly tailored for today’s urban mystic. What does healing actually look like? 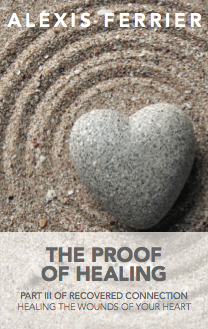 While we may know what the journey towards healing looks like when speaking of broken bones, diseases and even cancer, the process of healing the wounds of our heart can’t be measured by a blood test or an X-ray. These untreated wounds store the emotional pain we have shoved away out of fear of feeling the devastating hurt, sadness, anger, shame and doubt that we are really not good enough and lovable just as we are. In today’s society, we are taught to do anything to avoid feeling this pain! This path of disconnecting from our pain only leads to one place: disconnection with our heart, all of its desires and the radical experience of unconditional love. What does healing emotional pain actually look like? What are some things I can do to help support this healing journey to be more gentle and manageable? Is it possible to let go of the emotional baggage I’ve been carrying around in my heart for years? Is it really possible for me to love/trust again? If you’re reading this, you probably have asked yourself similar questions to these without receiving clear answers and/or a step-by-step guide to help heal the woundedness of your heart. Until now! In Part II of Recovered Connection, Lex Ferrier explores 10 different self-connecting practices. 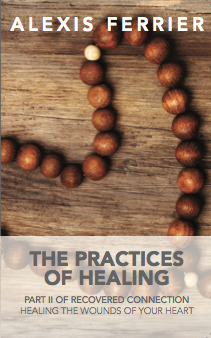 To purchase or read more about The Practices of Healing CLICK HERE. "Any wound to the heart affects your access to love – to love yourself, to love others and let others love you. We see the proof of our healing process when our capacity to love deepens and increases.” The last stage of the healing process calls you to take all of your “inside work” and bring it to your “outside world.” The Recovered Connection series has taken you on a journey through the darkness of your wounded heart, guiding you step-by-step to integrate charged emotional pain, as well as recover lost pieces of your heart. Now it is time to step back into the light, as through your diligent work you are now capable of responding to life in a more balanced, authentic way based on the reality of the moment vs. your unhealed heart wounds.